Just as Booker T. Washington was groomed by white philanthropists during the first Gilded Age to advance the cause of segregation, containment, and indoctrination of African-Americans, the philanthrocapitalists of our Gilded Age 2.0 have a whole slew of Booker T.'s to push the message of miseducation, austerity, and oppression of today's minority children in America's urban centers. 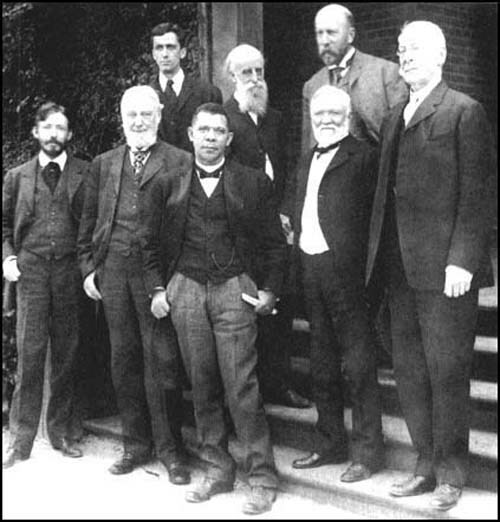 Above, Booker T. Washington (center front) surrounded by the Gilded Age millionaires who financed his approach to training black men and women during the age of Jim Crow.The latest trainee from Eli Broad's Big House Superintendent's Academy to be placed in charge of mangling another urban school system is Jean-Claude Brizard (Class of '07), who is fresh from a spectacularly-failed administration in Rochester, New York, where he earned an overwhelming no-confidence vote from Rochester educators (2,713 to 140). So now Jean-Claude is Rahm's black face for white Chicago-style corporate-run schools, and the Tribune's Wall Streetwalker editorial board couldn't be happier. After all, Jean-Claude has been placed there to impose corporate austerity measures by downsizing the workforce, outsourcing public jobs to corporate contractors, increasing class sizes, and shutting down public schools in order to make room for the corporate chain gang charter schools that will receive large financial incentives for replacing teachers and schools with testing factories managed and staffed by positivized and glassy-eyed TFA CEOs and line managers. "if you've done a job 15 years and you can't move achievement, you shouldn't have your job" . . .
And so Jean-Claude will begin Year 17 of the same failed corporate education policies that have wreaked havoc on Chicago's children and teachers and parents for almost two decades, even as poverty, misery, and murder have reached unprecedented levels. My suggestion to all of Chicago's citizens: Listen to Jean-Claude, even though he has no idea about what he has just said.